This large tick was spotted crawling near a passenger's head on a New Jersey Transit train Tuesday, as an expert issues a tick warning ahead of Memorial Day weekend. 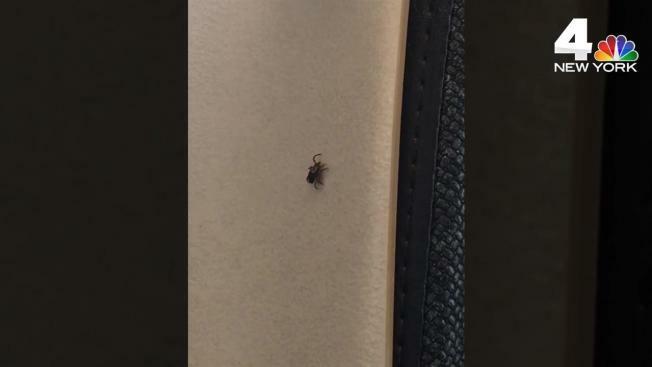 A New Jersey Transit rider captured stomach-churning video of a tick crawling up a seat across a headrest, coming startlingly close to a sleeping man's ear. News 4 viewer Kishauna DeCarmo says she was headed to Penn Station in New York from Newark Penn Station Tuesday morning when she spotted the creeping arachnid. "I thought it was a spider so I was kind of freaking out and I decided to videotape it just to show my friends," she told News 4 in an email. "But something about the light color on the top of it reminded me of a tick, which I've never seen in person." DeCarmo said she tried to warn the sleeping passenger as the tick crawled ever closer, telling him, "Hey, something is headed your way." "I thought he would kill it. He looked at it and then he tried to touch it!" wrote DeCarmo. "I said, 'Are you petting it?!' He said, 'No, I don't think it's dangerous. I just don't want it it in my hair.'" "He tried to pick it up a few times and then it dropped so I ran away," she said. Disease ecologist Dr. Richard S. Ostfeld, a senior scientist at the Cary Institute of Ecosystem Studies in New York, confirms the bug in the video is an adult female American dog tick, identifiable from the whitish spot behind the head. Dog ticks are capable of transmitting Rocky Mountain Spotted Fever and tularemia, but do not trasmit Lyme disease, he says. "These dog ticks are good crawlers and can really motor," Ostfeld told News 4 in an email. "The most likely way they'd get on a train is by hitching a ride on a passenger, then getting brushed off the person or just dropping off. "They can't carry out their life cycle on a train, so any infestation won't last," he added. A spokesman for NJ Transit said in a statement, "NJ Transit rail cars are routinely cleaned and inspected every day, and we have had no other tick complaints. More than likely, this tick came from a passenger who boarded the train." "We encourage customers who see an insect or bug in our rail cars to report it to a crew member," the spokesman said. "In cases like that, the rail car is immediately taken out of service." Ostfeld says he thinks dog ticks seem to be particularly abundant this year, though that's just from personal observation. Rocky Mountain Spotted Fever is a serious illness that can be fatal if not treated correctly in the first eight days of symptoms, which include fever, rash, headache, nausea, vomiting, abdominal pain, muscle pain, lack of appetite and pinkeye. Tularemia illness can range from mild to life-threatening, and all forms are accompanied by fever. Though the dog tick doesn't transmit Lyme, Ostfeld says the public should generally be aware that May through July is the high-risk season for Lyme and other tick-borne diseases because that's when nymphs are most active. The nymph stage is the middle stage of ticks, when the newly hatched babies -- called larvae -- take a blood meal from some mammal or bird, then drop off and molt into the nymph stage. The nymphs are tiny and responsible for most cases of tick-borne disease. "Use of repellents and permethrin-based sprays for clothing can help protect against tick bites," said Ostfeld. "Doing tick checks and removing any attached ticks quickly with a fine-tipped tweezers are important."